Summer dates will be added nearer the time so please check back if your required weeks are not currently available. 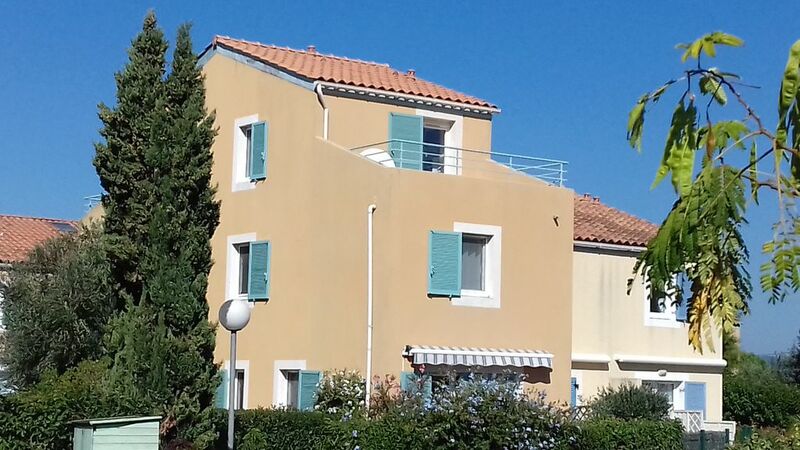 Modern, well appointed, 3 bedroomed house with roof terrace and free Wi-Fi, 44 kilometres west of St Tropez, 400 metres from 3km of sandy beaches, Miramar Marina, restaurants and amenities including watersports centre and sub-aqua school. Ideal for family summer holiday or year round location for walking and exploring the coast or picturesque villages and scenery of the Massif des Maures and the Iles d'Or or Iles d'Hyères, Porquerolles, Port-Cros and Le Levant, three unspoilt islands accessible by boat from Miramar or Hyères. Flights are available with Easyjet, Jet2 and Ryanair and the property may be reached from Nice Airport which is about one and three quarter hours drive from La Londe, Marseilles an hour and a half distant or nearby Toulon Hyères airport which is only 20 minutes drive away. Completed in 2002, the house is situated close to the rural town of La Londe les Maures which has good restaurants, shopping facilities and a Sunday market with local produce. Cannes, Nice and Monaco are all not too far away. The area itself has an excellent year round climate with up to 300 days of sunshine each year. July and August are the hottest months and is an ideal time for a family holiday with activites and entertainment on the nearby beach. During the season which extends from April to the end of September there are shops, a supermarket, bakery and cafés about 100 yards away and there is a good selection of restaurants at the nearby marina. There are twenty one wine-growing estates and chateaux where the Cotes de Provence wines may be sampled and bought. The house is 3 storey and sleeps 6 people. The ground floor comprises a lounge, kitchen, dining area together with a shower room with toilet and basin. Installed in 2012 the kitchen is well equipped with a fridge, electric oven and hob, microwave, dishwasher, coffee machine and ample cutlery and crockery. In the lounge area there is a 32' television, DVD player and a hi-fi system for CD’s and radio. The stairs from the lounge lead to the first floor on which there are two bedrooms, one with a double bed and one with two single beds. The shower room on this floor also contains the washing machine. The top floor has a double bedroom with a shower room en-suite. This room leads out on to the terrace. Hairdryers are available for the use of guests. There are electric radiators throughout the house. Garden furniture is provided for use on the private south-east facing patio to the front and side of the house. There are also 2 bicycles for exploring the extensive local cycle route network. The washing machine is in the first floor shower room. Our aim is to make our house as much like a home as possible so we ask our guests to replace any consumable items such as drinks, washing up liquid, toilet rolls etc that may be used up during your stay.. Unfortunately we do not have a barbecue as charcoal barbecues are prohibited in Var. Lovely home in a quiet peaceful area. The property is clean and well looked after. We had a wonderful week away and it was just what we all needed. We were very lucky with the weather having sunshine every day and we did a nice mix of day trips to see some new places and time relaxing at the house reading our books in the sun. We stayed at the property as a group of 5 and it was the perfect size for or group. We visited St Tropez, Cannes and the Gorge and had some lovely days out. We made it as far as Moustiers St Marie on our gorge trip which was absolutely beautiful and we were so glad we made the effort to get there. It was fairly quiet at the marina being out of season so not all of the restaurants were open but we had two lovely evenings out at La Rose des Vents where Christophe the owner looked after us very well! The location is within easy reach of Hyères, Toulon, Le Lavandou, St Tropez, Ste Maxime and the islands of Porquerolles and Port Cros. Also you can visit Bormes les Mimosas, Collobrières. The famous Aix-en-Provence is well worth a visit and Cannes, Nice and Monaco are easily accessible further East along the Cote d'Azur. The nearest beach, Miramar, is only about 400 yards away and caters for all sorts of water sports, boat hire and sailing schools. There are several other beaches nearby, some within easy walking distance. The area is well served with cycle routes. The golf course at Valcros is a short drive away. Minimum rental period in August is two weeks. Arrival time is normally 4.00 pm and departure 10.00 am. Towels, duvets, pillows, blankets and bed linen are provided. Rents include cleaning and laundry on departure. We ask that you make up the beds before you leave and take all washing to the laundry nearby.